Vancouver was voted the "Best City in the Americas" for 2004 by Condé Nast Traveler magazine, based on the categories of ambience, friendliness, culture and sites, restaurants, lodging, and shopping. This is just one of the city's many awards and accolades that clearly demonstrate the many reasons to visit Vancouver! 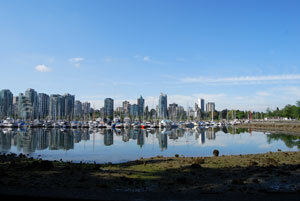 Vancouver was also the proud host of the 2010 Olympic and Paralympic Winter Games. Although you won't find "ski accommodations" in Vancouver, Vancouver is the gateway to Whistler Blackcomb and is definitely worth a visit before or after your ski holiday in Canada. Our featured hotel in Vancouver is the Terminal City Hotel Vancouver. Highly rated by our guests and on Trip Advisor®, this hotel will not disappoint. We are one of the only ski tour operators offering this Vancouver hotel as part of a ski holiday package. We work with all the major hotel chains as well as privately owned accommodations in Vancouver bringing you the best accommodation and deals available. Contact us with your preferences and we would be happy to send you some options.